This is the “missing” segment of Jimmy Darnell’s footage. The segment showing the press buses on Houston appears in the 2003 ABC documentary “The Kennedy Assassination: Beyond Conspiracy” during the segment about the HSCA acoustics evidence after the Weigman film. 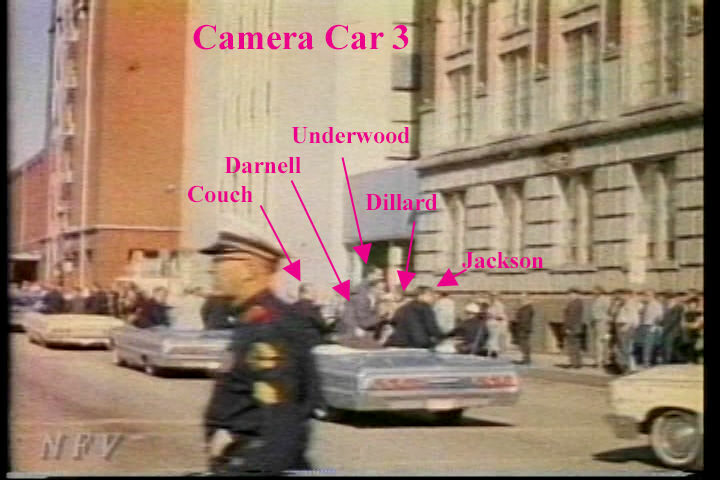 Darnell is also visible in at least two or three frames of Couch’s film running alongside Camera Car 3 while filming. What are the circumstances surrounding this? Why was it missing? Allow me to elaborate, by “missing” I am referring to the fact that the vast majority of clips of the Jimmy Darnell film do not contain the sequence of footage showing a.) the press buses backed up on Houston Street or b.) Camera Cars 1 and 2 moving down Elm (Darnell shot this after he jumped from Camera Car 3 and started running down the street). Most versions either begin with a modified version that shows the front of the Texas School Book Depository (nearly identical to the Malcolm Couch film) but exercise the footage with the press buses and Darnell filming while running, or other versions edit all these sequences out and cut directly to the scene on the north side of Elm Street showing Bill Newman pounding his fist on the ground. An interesting note to all this is that while Richard Trask reprinted a frame of the Elm Street sequence in 1998’s “That Day in Dallas,” his description of the Darnell film in 1993’s landmark text “Pictures of the Pain” does not mention any footage previous to that of the Newmans as I mentioned above. Below is a rough stabilization of the Houston Street clip. I find 17 unique frames for this clip. Filmed at 24fps the clip took less than one second. It does show some notable figures. The ghostly back-lit figures of Toni Glover and/or her mother are still standing on their perch. Someone, probably Howard Brennan, is sitting beneath that perch with his back to the wall. A second figure is low to his left in the shadow of the pool wall. What pleases me most is in the last 5-6 frames a man is seen at frame left running southbound on Houston street. I think that is Jim Underwood, as described in his WC testimony. ...When we turned onto Main Street downtown and headed west toward the scene of where the assassination took place, either the regulator or the mainspring in my camera broke and I was without a camera. I knew that we had two men, at least two men on the parade route who were on the street and would be filming the motorcade as we came by and I hoped to exchange my broken camera for one of theirs because I knew I could make more use of the one that would operate. The only problem was we went down Main Street so rapidly it would have been impossible to get anything from someone standing on the street and at Main and Record one of our men was stationed and I tried to holier at him my camera was broken and I wanted to switch and I started to and there was no point in it because we passed there that rapidly. I thought it was the fastest motorcade that passed through a crowd; this was really moving, as far as I was concerned. Then, we came to the scene where the shots were fired. Do you want me to go on? Mr. BALL. From the time you turned, tell me what you observed after you made the turn at Main and Houston to drive north on Houston. Mr. UNDERWOOD. After we turned onto Houston Street, the car I was in was about, as far as I can remember, about in the middle of the block or a little bit north of the center of the block, which is a short block, when I heard the first shot. Mr. BALL. Between Main and Elm? Mr. UNDERWOOD. Yes; between Main and Elm, closer to the Elm intersection, Elm and Houston intersection, when I heard the first shot fired. I thought it was an explosion. I have heard many rifles fired but it did not sound like a rifle to me. Evidently must have been a reverberation from the buildings .or something. I believe I said to one of the other fellows it sounds like a giant firecracker and the car I was in was about in the intersection of Elm and Houston when I heard a second shot fired and moments later a third shot fired and I realized that they were by that time, the last two shots, I realized they were coming from overhead. Mr. BALL You realized they were coming from overhead and that would be from what source? Mr. UNDERWOOD. That would be from the Texas School Book Depository Building. Mr. BALL. It sounded like they were coming from that direction? Mr. UNDERWOOD. Yes, sir; the last two. Now, the first was just a loud explosion but it sounded like a giant firecracker or something had gone off. By the time the third shot was fired, the car I was in stopped almost through the intersection in front of the Texas School Book Depository Building and I leaped out of the car before the car stopped. Bob Jackson from the Herald said he thought he saw a rifle in the window and I looked where he pointed and I saw nothing. Below the window he was pointing at, I saw two colored men leaning out there with their heads turned toward the top of the building, trying, I suppose, to determine where the shots were coming from. Mr. BALL. What words did you hear Bob Jackson say? Mr. UNDERWOOD. I don't know that I can remember exactly except I did hear him say words to the effect that "I saw a rifle" and I looked at that instant and I saw nothing myself. If he saw a rifle, I did not. Mr. BALL. At that point when you looked, where was your car? Mr. UNDERWOOD. Our car was in the intersection, in the intersection of Elm and Houston Street. Mr. BALL. Had it made the turn yet? Mr. UNDERWOOD. It had partially made the turn or had just begun to make the turn. Frankly, I was looking up and around and I saw at the same time people falling on the ground down the street toward the underpass and my first impression was some of these people falling to the ground had been shot. Mr. BALL. Did your car stop? Mr. UNDERWOOD. Our car stopped and the minute it stopped I leaped out of the car. Mr. BALL. Where was your car when it stopped? Mr. UNDERWOOD. Right in the intersection, perhaps just past the intersection, turned onto Elm. Mr. BALL. Did you get out before the car parked along the curb? Mr. UNDERWOOD. Yes, sir; the minute it stopped, I leaped over the side. Mr. BALL. What did you do? James, thanks for this gif. I agree that the running man at the end is likely Underwood. The figure next to Brennan might be Amos Euins, who said he ducked down next to this wall. I will try to post a frame from the Darnell film which has been misidentified as a Couch frame. I'm sure it is just a few frames before, and actually continuous with, this recently discovered segment. The camera is at the same tilt, shows part of Couch's arm in the lower left corner, and also the 1st and 2nd camera cars. It leads me to believe that your first frame shows the first camera car and a police motorcycle, both to the right of Couch's hand. Sim, here are the first two frames of that sequence with the first frame on the right side. I thought I had the second sequence as Darnell filmed down Elm street but can't find it. I don't know if that would be Euins next to Brennan. Every video documentary I've seen shows Euins behind (south) of the block that Glover is on. Strangely, Forrest Sorrels in his WC testimony thought Euins had a companion that ran away from the scene. I've wondered what happened to Underwood's camera he left in the car. Are we seeing that camera in Couch's hand? There are some perpendicular markings showing under his right hand that I've not been able to find in other photos (contemporaneously or on Ebay) of B&H Filmo 70 type cameras (used by Couch). To the left of frame we see the handle of a camera pointing roughly to the 8-9 o'clock direction (and parallel with the TUP), whereas it is usually at 6 o'clock. If Couch was filming during these frames there would be noticeable rotation of those frames (portrait vs landscape orientations). I'd like to see how your questioned frame compares. James, here is the frame I've been posting about. It is a rogue item, because it was mistakenly called a Couch frame when I copied it off of the internet years ago. I have no idea what internet source I got it from, but I did realize that it doesn't fit in Couch's film. Couch filmed the identical moment from a point just to the left of this one. Therefore, this must be a Darnell frame...like the same sequence of the front of the TSBD which appears in both their films, almost, but not quite, identical...you get the idea. The first camera car and the motorcycle cop can, I think, be seen in similar positions in the two frames you have last posted. The quality of our respective images is very different, but the angle and actions of the cameraman seem the same to me. Sim, thank you for the frame. There can be no doubt it is from Darnell. I matched the equivalent Couch frame by creating stereo pairs until I found a frame that helped to place the motorcycle (Haygood?). 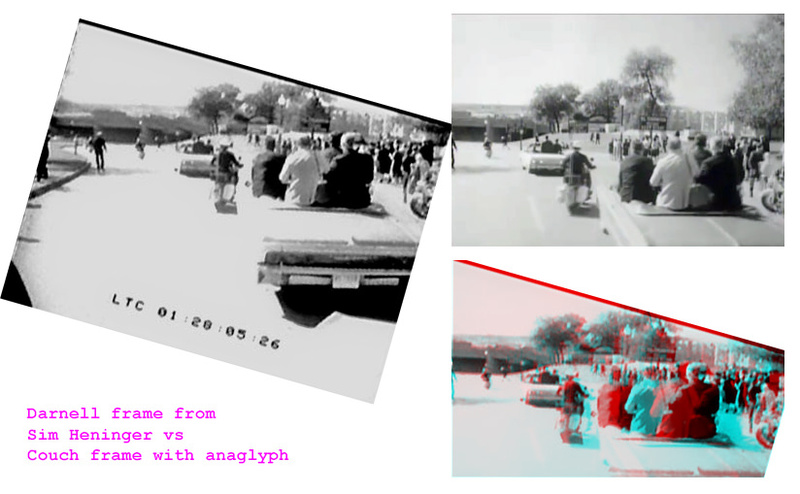 There is only a small amount of overlap of those two frames, but enough to get a reasonable anaglyph – just for fun. nice....have to get me some of them glasses. In the Darnell frame showing Haygood, just below the 2nd cam car's license plate, the corner of the front left fender of cam car 3 can be seen. It was a '64 Impala, I believe. 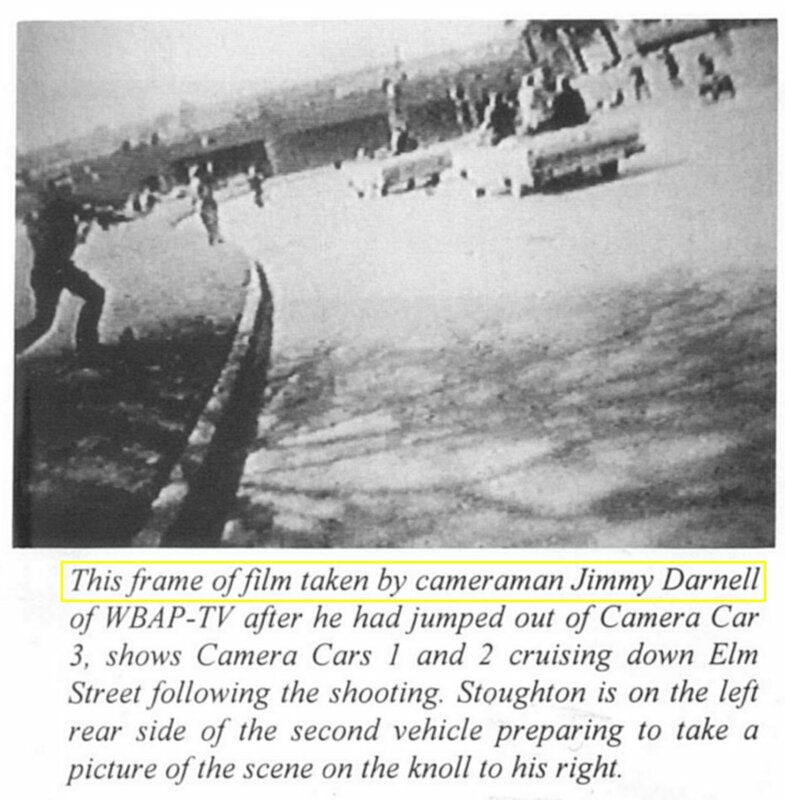 This shows that Darnell's/Couch's/Dillard's/Jackson's/Underwood's car was stopped halfway through the turn onto Elm, just as they all said, when they jumped out or started taking pictures.